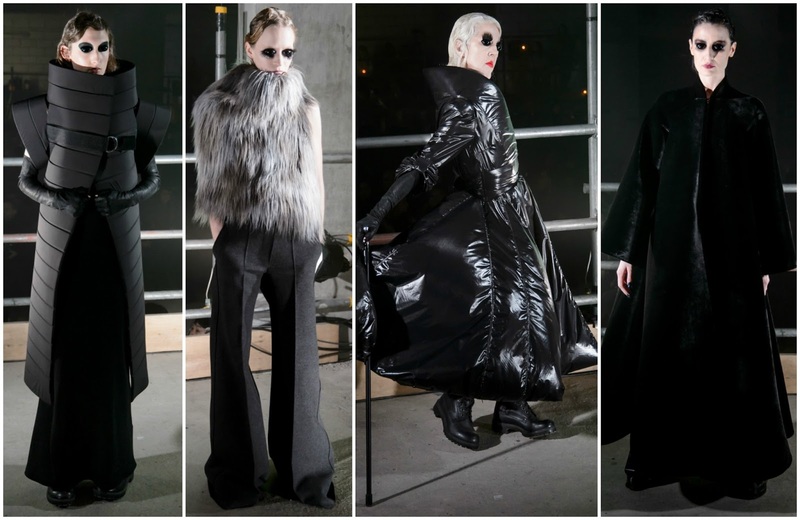 There has been an overriding political tension accumulating in Gareth Pugh's work since his return to London Fashion Week two years ago. His return saw him explore love of country, frenzied supporters of clubs; from there he opted to use money as the collection's currency, presenting it in Soho, which is currently being gentrified and forcing the closure of historic nightclubs and disembowelling club culture. There was an ode to Hillary Clinton and the power and dominance of a prima ballerina before a foray into body politics. His Fall 2017 show, undoubtedly, was the one with the most chutzpah, the most unapologetic expression of thematic influences in recent memory. Fascism: a political theory advocating a authoritarian hierarchical government (as opposed to democracy or liberalism); favoured by the likes of Marine Le Pen, Donald Trump, Adolf Hitler and Benito Mussolini--it was a tall order. Some will argue fashion shouldn't be political, it should be--as it is expected of the masses--removed from the world's stage, reserved for back door discussions and private conversations between confidants. Fie upon that school of thought, says Pugh. After a dearth of political expression in the aftermath of Donald Trump's presidency, Pugh's Saturday night show in a dungeon-like, dank, disquieting, brutalist basement in Islington, was the antithesis to the optimistic glamour of the earlier evening and the general disconnect of the season as a whole. With dashes of showmanship and a helping of overt theatricality, the models procession was a mostly black, occasionally grey tonal colour study that issued a response to the bleakness and dread of the world. 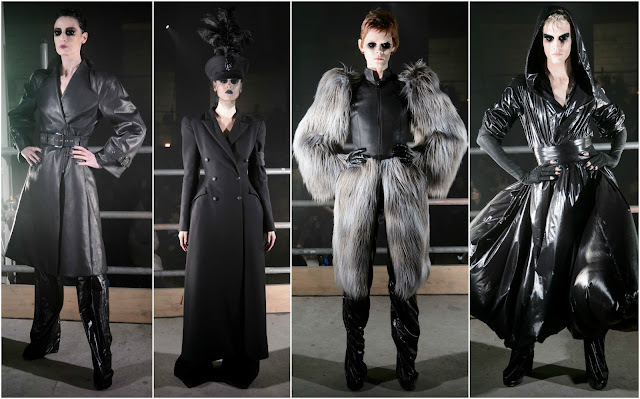 It began with legendary model Erin O'Connor commandeering the runway, with her hands firmly placed on her hips; her leather coat and baggy trousers conveyed the power of an official figure. The cinched waist and pronounced hips of a blazer with a guard's armband and kepi hat were dramatic allusions to law enforcement. The monochromatic nature of the show provided for striking viewing material, the utmost attention required to capture the clothing in all their glory. The models' domineering stride intimated, to say the least. One lavished in the luxurious, Italian-inspired tailoring that popularises Pugh's oeuvre globally. These were clothes that in the show format were injected with an unflinching and unmissable theme but on the shop floor have the ability to be a pristinely pair of pants or a sumptuous cost. Theatricality and drama contribute to the awe-inspiring effect of the show. Without the forceful opinion, the jolt, the unavoidable call to action; these would just be 'clothes'. The fashion element derives from his insistence on reflecting the political reality of the world, the prominence of fascism and how we should respond. Dominance, power, strength and forcefulness are the ways forward according to Pugh's manifesto. The posse of models were frightening; in the face of adversity galvanising people into action by encouraging them to explore a darker side to themselves may prove necessary. The show's resilient spirit urged one to condemn the heinous inflictions of the powers that be and reject them. In light of recent terrorist attacks (which remind us of the importance of the arts as a safe place), the word "defiance" springs to mind. We will not succumb to terrorism. We will unite. Most importantly, as expressed here, we will fight back.